You can talk with teammates through task comments and/or messages. If you do not use any of the options, the text will appear as normal. Select the task name to open up task details. Here, you can enter a comment about the task. You can include a file in your comment, and notify teammates. When entering a comment, you can choose to notify teammates. A teammate can be notified via the in-app notification icon and by email. Whoever created the task and/or whoever is assigned will be automatically checked to be notified. You are not given an email copy of a comment that you write. If you want to notify everyone who was previously notified on a comment, select Previously Notified. Freelancers who are not assigned/assisting to the task are not shown as an option to be notified. Clients who cannot view the task list (or the tasks inside) are not shown as an option to be notified. Once you click Add Comment, an email notification will be sent to your teammates. 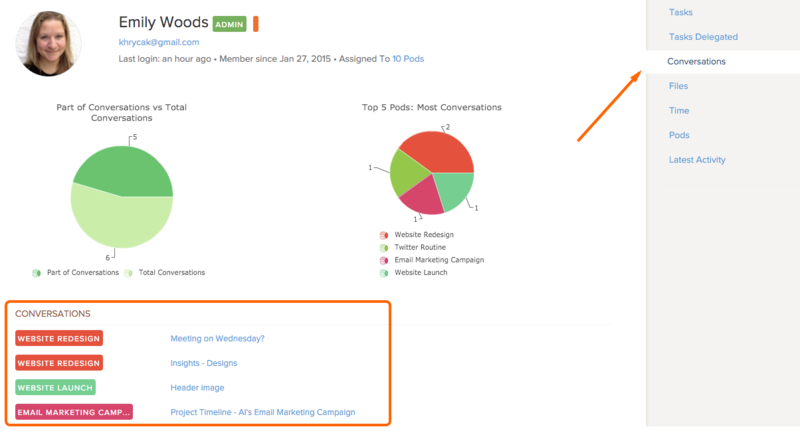 The next time you open the task details, hover your mouse over the number of people to see who was notified. 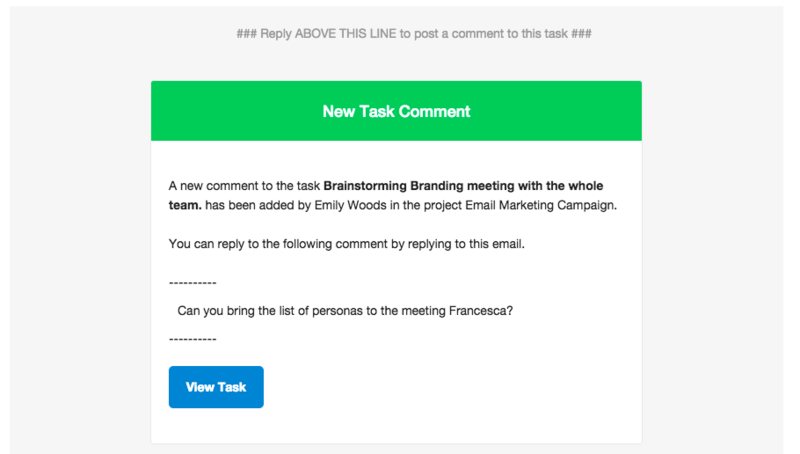 When writing another comment, the creator of the task and the person assigned will be automatically checked. Click Previously Notified to automatically check anyone else who was notified. When you or a teammate receives a comment via email, you can reply to the email you receive. Your reply will be added as a comment. Messages work very similar to task comments, but they are not connected to a task. You can involve multiple teammates, have them comment back or like your message, archive older messages, and have it all kept within your pod. 1. Go to Messages and click New Message. 2. Enter the subject and your message. You can upload a file, make it visible to your client, and also select teammates to notify of the message. You can like a message by clicking like message. If you no longer need a message in your messages area, you can archive it. 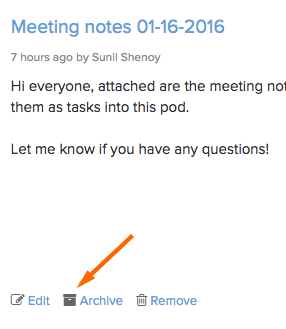 Hover your mouse over the message and click archive. You can recover archived messages any time by going to Archived Messages on the right hand side. Then, hover over your message and click Restore. 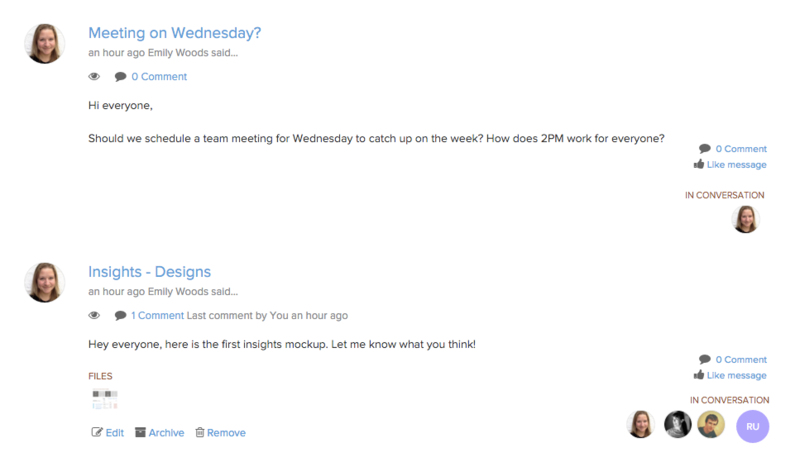 If you are looking for a conversation history, there are 3 places to check: Tasks, messages, and the Me page. Comments are shown in a running commentary on tasks. On the tasks page, tasks with a comment have a speech bubble icon. In the image below, this task has 1 comment. When you click a task to open task details, you will see the conversation history. Messages on the message page are shown in a list. If you are notified on a message, you will receive an in-app notification as well as an email. Messages can also be found on your Me page. An administrator can look at the Me page of anyone in their Brightpod account. Team members, freelancers, and clients can only see their own Me pages. 1. Go to the Me page. 2. On the right side, click Conversations. 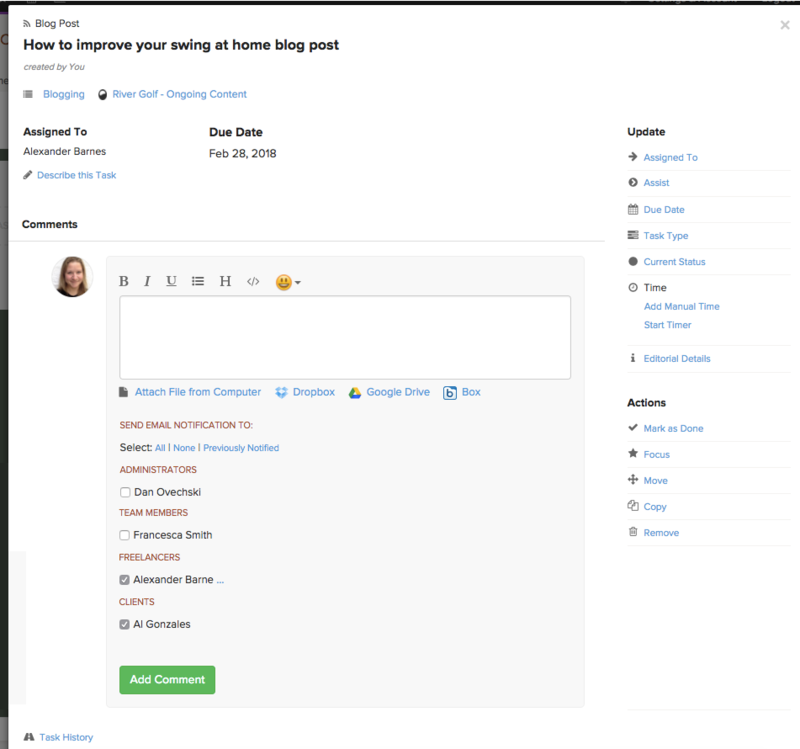 For Comments, clients are able to see comments that are on tasks within task lists that have been marked as visible to clients. You must first mark a task list as visible to clients, then you will be able to write comments on tasks, notify them of comments, and have them be able to reply back.. Tip: Learn more about marking tasks and task lists visible to clients. When you are adding a comment, your client will be under the Clients permission level. For Messages, you can add your client to the conversation at any time. 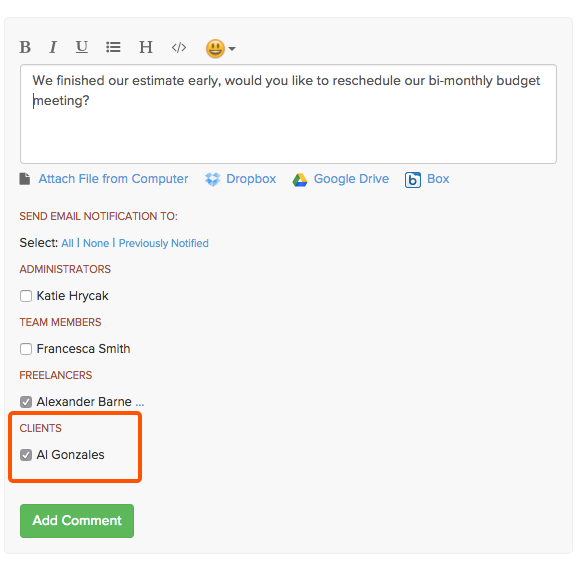 When creating your message, select the checkbox Visible to Clients before adding your message. 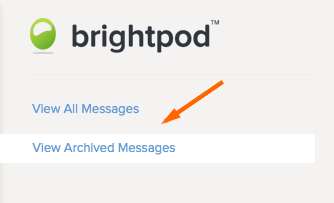 Brightpod Send allows anyone who has your unique Brightpod email address to add tasks, task lists, messages and files to a pod via email. 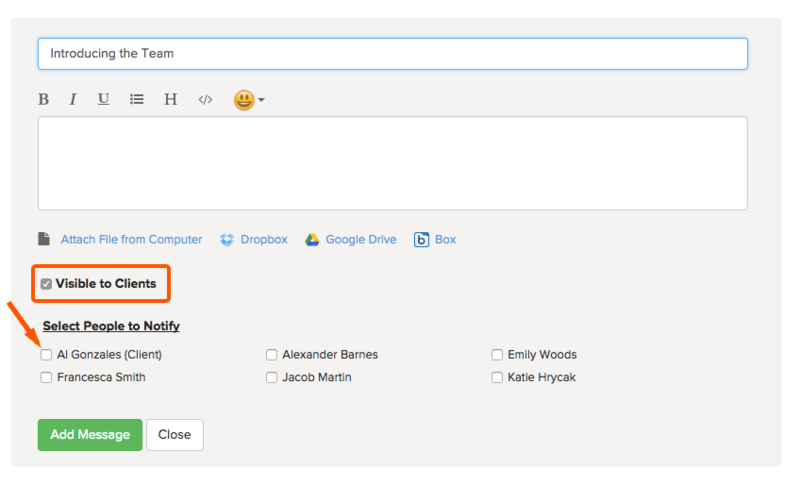 Each of your pods (projects) in Brightpod will have a unique email address. 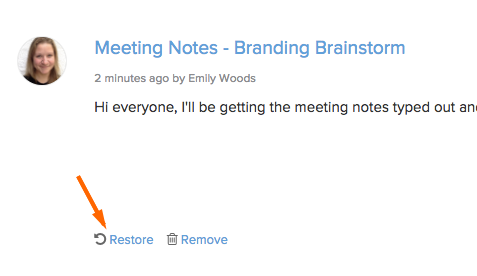 This is a great way for people outside of your team to send you tasks. 1. Go to the Pod that you want to share. 2. On the top left, look for the icon next to your Pod name, click it then select Send. 3. Click Send and get your unique email address. Add it to your email contacts to start working. This email address is unique to your pod. This is what you share with anyone outside of your team so they can email in messages. 1. From your regular email client, compose a message. 2. 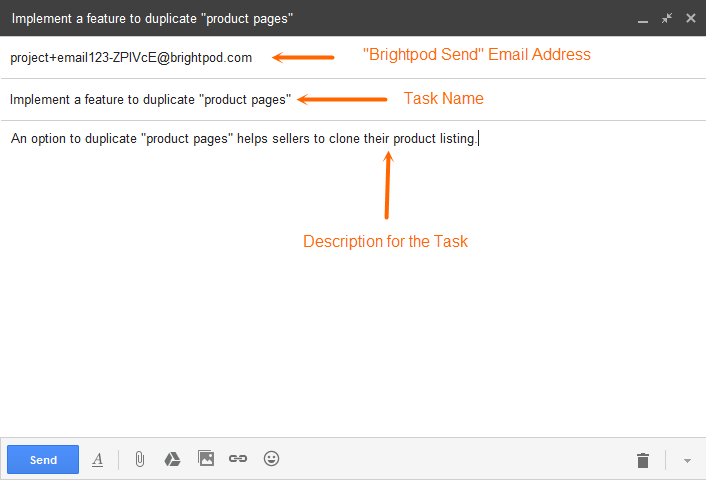 Enter the unique Brightpod Send email address in the email id field. 3. Your email subject will be the Task Name. 4. Enter a description for your Task in the body of your email and submit. On the submission of an email, a new task will be created in your project. You can personalize the email address by clicking on Change Send Settings. You can choose a name that you wish. The prefix “Project+” is used to identify the email address and the suffix “-XXXX” is used to encrypt the email address, these won’t be changed. 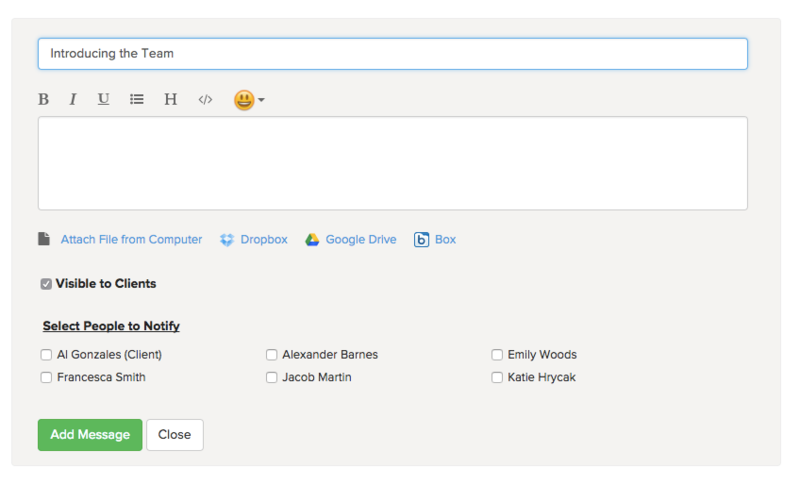 Administrators and Team Members may customize the email address. Emails sent to the deactivated email address will not get parsed. Select a Task List where you want to add Tasks using the dropdown under Add new task to. 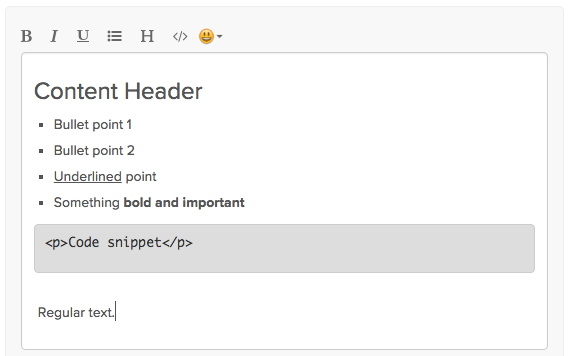 Tip: Learn more about the capabilities of Brightpod Send.